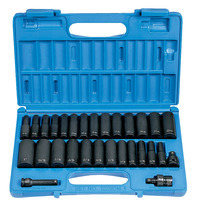 Grey Pneumatic 3/8 in Drive Pneumatic Deep Length 29 Piece Socket Set includes 12 fractional deep length pieces, 14 metric deep length pieces, a 3 in extension, an adapter sized 1/2 in female that connects to 3/8 in male and an universal joint measuring 3/8 in x 3/8 in. 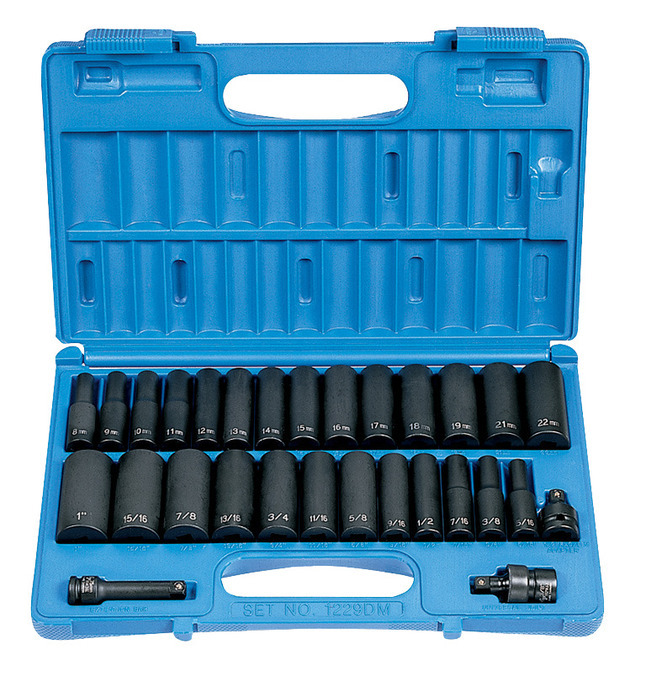 The fractional deep length pieces are sized 5/16 in, 3/8 in, 7/16 in, 1/2 in, 9/16 in, 5/8 in, 11/16 in, 3/4 in, 13/16 in, 7/8 in, 15/16 in and 1 in. The metric deep length pieces are sized 8 mm, 9 mm, 10 mm, 11 mm, 12 mm, 13 mm, 14 mm, 15 mm, 16 mm, 17 mm, 18 mm, 19 mm, 21 mm and 22 mm.